Fire Emblem: The Sacred Stones is the sequel to the quality masterstroke Fire Emblem: Blazing Sword (generally referred to as “Fire Emblem”). Both games being on GBA, Sacred Stones incorporates all the technical achievements of its predecessor. It even adds a deeper class promotion system. But Sacred Stones has one drawback, one beyond its confines. It’s the sequel to a great game. Comparisons are inevitable. If Sacred Stones was the first Fire Emblem released in North America instead of Blazing Sword, some critiques would evaporate. On the other hand, Sacred Stones capitalized on the success of what came before. So with that boost comes responsibility as a member of this long-lived franchise (it’s entry number eight). Don’t get us wrong. Sacred Stones is an excellent SRPG dripping with quality in (almost) every respect. It’s a fine example of 2D gameplay, pixel art, and animation. But no game is perfect, and even the best franchises need constant refining. The set-up for Sacred Stones is top down, 2D battle maps. Combat is shown on a separate screen with 2D pixel art animations. Legendary Graphics: The main stars of the game could use legendary weapons. It’s an ability unique to them. The effect features a distinctive, screen-wide, eye glimmer. Also accompanied by special music, the entire mechanic is a fun and welcome addition. Choosing to be Classy: As mentioned, the promotion system is improved over the previous entry, now offering two options at upgrade time (sparingly like Vandal Hearts). For example, the cavalier can choose the paladin class or great knight. Options like this, spread throughout your crew, encourage playing the game your way. An Added Touch of Class: Along with the promotion options are new classes. Now bishop, summoner, or mage knight are available for the choosing. The more ways to tailor a fighting force to the player’s preferred style, the better. Flashbacks: They can be double edged swords, sometimes taking you out of the narrative with dry recitations. Fortunately, Sacred Stones does theirs well. Although the story and characters have their own issues (see bad), it wasn’t because of the flashbacks. Fire Emblem, as a franchise, has a distinctive character art style. The fine looking tradition continues here with quality. The 2D animations are exciting and great fun. It’s an art form that’s come to be appreciated by a new generation of gamers. Hello Goodbye: The game introduces units mid-battle. Often these are enemy reinforcements. But sometimes they’re new friendly units needing protection. Depending on the current tactical situation, this can prove almost impossible. We lost two summoners this way, and with them the entire class! There’s no opportunity to recruit another. Does a vital class have to be introduced this way? With failure being so likely? Don’t design mechanics that promote restarts. And consider offering at least one secondary chance to recruit each class. The developers did all the work to create these classes, how about insuring the player has a chance to try them out? Will these siblings live long enough for a family reunion? Sealed with a Class: T Seals are special items units need for promotion. It’s not a bad system, and has the benefit of “promoting” playing how you like by making the characters you prefer more formidable. That said, being too stingy with them forces the player onto an unnecessarily narrow road. Sacred Stones holds back too much with these. Let the player have flexibility! The objects aren’t necessary to beat the game or get a good ending. Finding the shop doesn’t require onerous and mindless button pressing against walls. A FAQ is not required to realistically find these shops. Experiencing where these shops are located leads us to believe points 2 and 3 were violated. Drop hints in dialogue and other places as to the locations of secret shoppes. Have side quests to obtain maps to them. Befriend NPCs so they might show the player where to look specifically. Developers need to be creative and think outside of the FAQ box. The previous game had a prologue with an option to start with one of three major characters. The practice is not continued, and missed. While great epilogues that take you into the future of all the characters aren’t absolutely necessary, Sacred Stones uses only dry write-ups. They’re underwhelming in comparison to Blazing Sword. Grinders, and not the sandwich type: The first grind tower took us over five hours to beat. We’re grateful for leveling opportunities, especially in this game where the stakes are so high. But should we need to grind that much outside of story missions that early on? Break grind missions into manageable chunks, not inflexible mega-missions of enormous size. Pegasus knights are one of Fire Emblem’s more distinctive classes. We like them, but in Fire Emblem: Blazing Sword we had trouble being successful with them. They were too vulnerable to bow attacks. Progress on this front has been made, although the class isn’t quite balanced yet. However we were more successful this time around. Endless Enemies: It’s challenging introducing enemies into an ongoing skirmish. But worse is introducing an endless supply of enemies to force the player along. There has to be a better way in a permanent death game. The Red Pill or the Blue Pill: What’s a player to do when faced with branching story battles? Miss out on hand-rafted scenarios, that’s what. Whichever way you choose, you’ll miss something. We don’t like missing out. It may be good for replay value, but that’s such a low percentage of players. Better ways exist to customize a player’s game experience without creating content that will never be used. Make the same battle map approachable from two different directions and let the player choose according to his play-style. Let the player pick the order of variously styled battles, informing them succeeding ones will be harder because the enemy is alerted. Open bypassed maps later as optional battles for leveling up, quest, etc. The desert level takes a tremendous amount of time to complete, upwards of two entire play sessions. On one battle! A full dozen units need direction, and three more are added during the fracas. And against them are enough enemies to challenge this many heroes. Add to this mix buried items and two, count them, two bosses. Is this necessarily bad? No. We’ve come to understand that, for example, long books are not problem for fans of the genre. Epic battles such as this can be appreciated by SRPG aficionados. Our one caveat might be that Sacred Stones is hand held, and not a home console game where longer play sessions are more acceptable. This mega-encounter clocked in for us at a whopping seventy-one turns. It may only be eclipsed by a 98 turn super-epic that occurred in Advance Wars. Russian Roulette CRiTicALs: All our losses, ALL, are from unpredictable and uncontrollable critical hits. Death is permanent in Sacred Stones, and hit points often cannot withstand a single critical strike. It’s a poor way to lose a unit, especially if one is playing well. These unfortunate, unfair occurrences promote negative thoughts. Emotional Impact of the Story and Characters: It’s lacking, admittedly, largely in comparison to Fire Emblem Blazing Sword. But this game follows what came before, and that can never change. It’s the single biggest issue. We wanted to care more for these characters and their plight. On the bright side, this touching family reunion is possible if you win. We like happy endings. Chapter Transitions: They’re a shadow of what the franchise previously accomplished. Such accomplishments should be built upon and not lost. Gone is the epic, sweeping music that used to accompany the text and our journey narration over the world map. Fire Emblem is among the greatest SRPG franchises. It has the quality of Shining Force III, and the prolific nature of Disgaea. It makes 2D work like Advance Wars, and has the longevity of the Matsuno family of games. It’s certainly worth your money and time for the fun it offers. Another good thing about Sacred Stones is how it keeps the SRPG fires burning in the marketplace, plus it draws back fans of the franchise and new players who have gotten word. Sacred Stones is enjoyable Fire Emblem, just not as enjoyable as the Fire Emblem that preceded it. That’s no great crime, as most SRPGs cannot live up to Fire Emblem: Blazing Sword. We recommend Sacred Stones as it is an epic journey of strategy. Special thanks to FireLillyCosplay.com who apparently made it her goal to cosplay every cool-looking female character from Sacred Stones. Spot on review. I laughed when you mentioned crits, because honestly that really was a real pain, same goes for the desert level. I do miss when you covered more obscure (okay, just one’s I haven’t played) SRPGs, but there’s not many to go around, I suppose! Thanks for the kind words Siveon. Yeah, criticals in a perma-death game have to be carefully implemented. In regards to obscure SRPGs, you’ve undoubtedly checked out our “Every SRPG” list page. There are some little known games there. 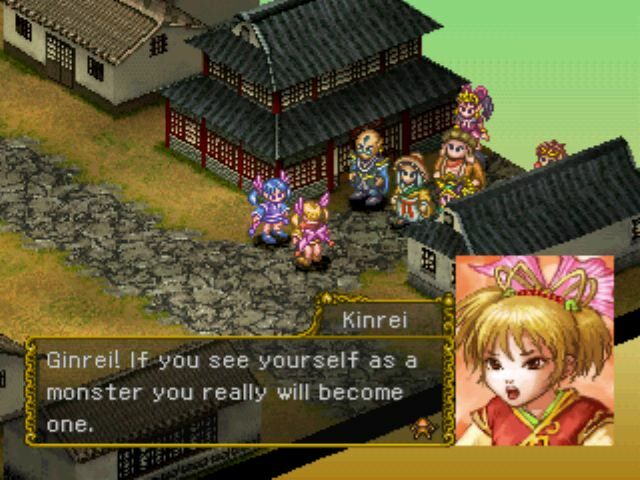 Perhaps you’ve played Saiyuki Journey West, but have you really played Astonishia Story? Or dare I ask, PoPoLoCrois? We are working our takes forward, hitting the oldest on the “Order Played” and some of the most recent. We will be getting to obscure titles, rest assured. And thanks for your continued participation!